There was widespread coverage of the ONS crime statistics which were released yesterday morning, with front pages stories in the Express, Telegraph, Metro and Independent. The papers report that police have recorded another surge in violent offences including murder, manslaughter and stabbings as the number of police officers and detection rate decreased. The Mail states that thousands of criminals, including rapists, burglars and thieves, are "escaping justice". In an editorial, the paper says such soft justice only "emboldens criminals". The Guardian reports that in an alarming day for crime and policing, a rush of statistics prompted warnings of a "public health emergency" and an "epidemic of violence". The Express reports on a carjacking in Birmingham where a baby girl was snatched and says it comes on the same day that violent crime hits a shocking new high. The Guardian (splash) and Telegraph report that British police and intelligence agencies are using children as "spies" in covert operations against terrorists, gangs and drug dealers. It says a House of Lords Scrutiny Committee revealed the practice while raising the alarm over Government plans to give law enforcement bodies more freedom over their use of children. Some of the child spies are aged under 16, the piece claims. It reports that according to the committee it was worried about proposals to extend the period of time between each occasion that juvenile covert human intelligence sources go through a re-registration process, from one month to four. 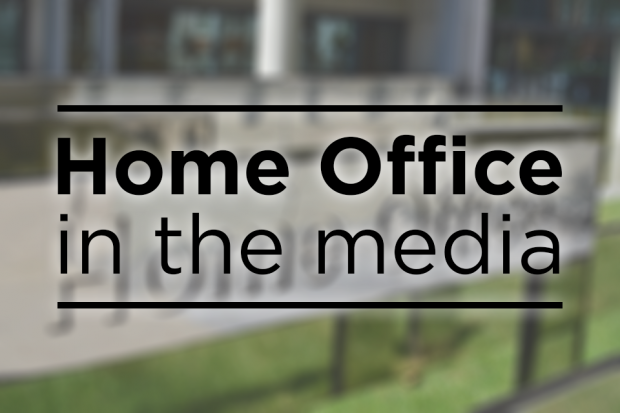 The Guardian reports that Home Office correspondence with the committee published in the report suggests that children are assigned to collect information on behalf of agencies. Juvenile covert human intelligence sources are used very rarely and only ever when it is necessary and proportionate and when there is no other less intrusive way to get the information needed to convict criminals or terrorist suspects. This could include helping to prevent and prosecute gang violence, drug dealing and the ‘county lines’ phenomenon all of which have a devastating impact on young people, vulnerable adults and local communities. Their use is governed by a strict legal framework and is overseen by the Investigatory Powers Commissioner, Lord Justice Fulford. Throughout any deployment and beyond, the welfare of the young person is the paramount consideration. The Guardian, Times, Mail and Metro report on the Advisory Council on the Misuse of Drugs (ACMD) advice yesterday on cannabis-derived medicine. The papers say that the ACMD announced that doctors in the UK should be able to prescribe cannabis-derived medicine. The ACMD has recommended that cannabis-derived medicinal products should be placed in schedule 2 of the misuse of drugs regulations 2001, allowing them to be prescribed by clinicians. Reports say the ACMD has recommended that a definition of these products must be decided, and clinical trials must take place, before this can happen. The papers note that the Home Secretary has said he is grateful for the review and is carefully considering the recommendations. I am grateful to the Chief Medical Advisor for her review of the medicinal and therapeutic benefits of cannabis and to the Advisory Council on the Misuse of Drugs for their short-term advice on scheduling. I am carefully considering both recommendations and will make a decision shortly. There is coverage in many papers of the Windrush compensation scheme. The Times reports people affected will be allowed to claim compensation for losing their jobs, state benefits, legal fees or for being held in detention or removed from the UK. It also states they may be able to claim for any anxiety or stress caused. Today marks an important milestone in our efforts to right the wrongs experienced by the Windrush generation – who have made such a massive contribution to the UK. Along with the other measures I have announced, the compensation scheme will help rectify the injustices of the past. I want a scheme that is fair, comprehensive and accessible – but we must listen to those affected and ensure we get it right. That is why we have launched the consultation – and I encourage anyone who has been affected to have their say on how it should work.